Tammy365: Can You Rob God? I'm sitting in church Sunday with an angel on one shoulder and a devil on the other. I was leaning toward doing the right thing but my fears kept me listening to all the good excuses the little red devil yelled at me. His voice almost overpowered my angel. I said "Almost". I managed to shut him out and write our tithe check for the morning offering. I'm sure the people around me heard my sigh of relief when the sermon title was displayed on the overhead...Stewardship: Financially Giving to God! The verse our pastor used spoke even clearer to me. Malachi 3:8 "Will a man rob God? Yet ye have robbed me. But ye say, Wherein have we robbed thee? In tithes and offerings." Big Gulp! 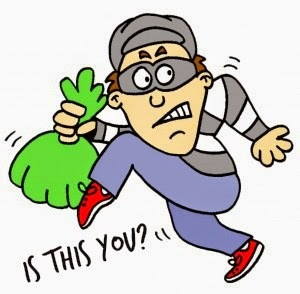 I may not look like a typical robber with a striped shirt, mask and money bag but if I withhold financially from God, I'm a thief. Have you been in this spot before? You want to give to God but you're thinking of every reason why you need that money in your pocket. It's seems way too easy to justify keeping it sometimes, doesn't it? God loves a cheerful giver. He always amazes me with our finances. I've never come up short when giving willingly but I've definitely felt the pinch when I'm stingy with our household money. Know what I mean? Are you a good thief? Can you rob God and not get caught? I welcome your comments/thoughts about tithes. I know the struggle. Sometimes it is truly difficult to write over those checks knowing the list the devil has looming in our heads of all our "needs" but I also know that somehow my finances are always better when I'm giving God his first! Thanks for sharing! This is a real struggle...my family and I struggle with this alot....we got saved over 10 years ago and I am sad to say we do not consistently tithe. It bothers me not really the hubs...sometimes it comes to his mind...but I am the one that has the devil and angel on her shoulder. An example would be this week, i bought 4 tires for the car...they were needed, and since I did that if i write a tithe check then i am cutting into our bill money...i know the right thing to do is tithe anyway, but I am absolutely scared to death. especially when i suspect my three year old may need to go to the doctor...she has symptoms of a uti.....anyway please pray for me...thank you for sharing!